The upcoming Appl e iPhone 8 is without a doubt the most highly anticipated smartphone of the year. The fresh new design of Apple’s latest mobile device has been creating a buzz for months now, and the brand’s fans are finally set to get what they’ve been waiting for with a sneak peak of the new device in September. In just a few months’ time, Apple is set to unveil three new iPhone models: The iPhone 7s, the iPhone 7s Plus, and the iPhone 8. 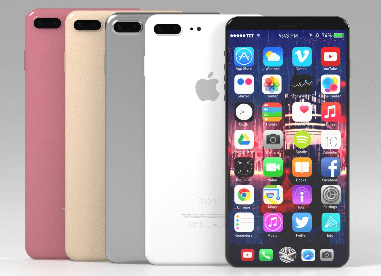 According to numerous reports, the iPhone 8 will boast an attractive and bold new design; a stainless steel frame and two 2.5D glass panels, making for a completely seamless device, with a dual-lens camera system, an LED flash, and a game-ready microphone. However, mobile gamers are even more excited about the iPhone 8’s specs, which are expected to make mobile gaming more immersive than ever before. The mobile gaming community is one of the most zealous when it comes to new gaming technologies, and Apple’s latest creation is definitely set to impress with its innovative new features. The iPhone 8’s processing power will make gaming a breeze thanks to an update on the iPhone 7’s A10 fusion chip that made console-like gaming possible. In tests, all manner of mobile video games and casino games ran smoothly on the iPhone 7 without a hitch, and Apple is expected to improve on this system yet again in its tenth-year celebratory model. The iPhone 8 is also expected to have improved functionality in general – in part due to its groundbreaking A11 fusion chip for seamless and fast-paced game play. It’s rumoured that the iPhone 8 may even boast split-screen app capabilities to allow players to enjoy video games, online games, and even mobile casino games in tandem without interrupting either one of their choices. Yet another feature of the upcoming iPhone that will interest gaming fanatics is its battery, which is rumoured to be getting a boost to increase both its performance and safety. The iPhone 8’s battery is even set to boast wireless charging, very similar to that of the Apple Watch. This adds a very interesting element of flexibility to gaming, as players won’t have to stop mid-game to plug their chargers in, lest they be disconnected due to those dreaded low battery levels. In the meantime, Apple’s removal of the 3.5mm headphone jack has remained a steadfast decision for the new model. Many mock-ups of the device have been created, but Apple gamers will have to be patient until the new device is revealed within the next four months to discover all the juicy details.